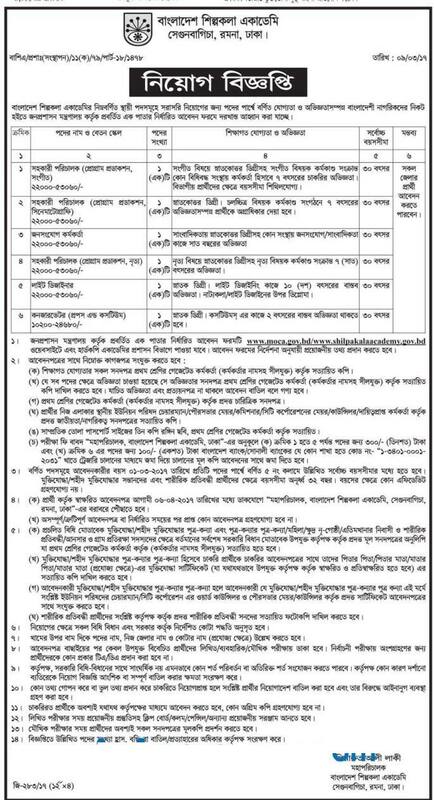 Bangladesh Arts Academy Job Circular 2017 has been published in daily newspaper and to found in my website in BD Jobs Careers–www.bdjobscareers.com. The Bangladesh Arts Academy is under the Ministry of Cultural Affairs cultural center of Bangladesh that managed cultural affairs related all of work across the Bangladesh. It is the national academy of fine and performing arts. The activities of the academy also include organizing workshops, seminars, discussion meetings, short-term specialized training, providing scholarships and financial grants for talented artists, organizing competitions in the various fields of fine and performing arts. Good News is that, recently the government origination published a new job circular for appoint to new man power of position Assistant Director (Program Production, Music), Assistant Director (Program Production, Cinematography), Assistant Director (Program Production, Dance), Light Designer, Conservator (Prapasa and Cosmetics ). To see full Details with job circular image. Apply Today!! Post Position: Assistant Director (Program Production, Music), Assistant Director (Program Production, Cinematography), Assistant Director (Program Production, Dance), Light Designer, Conservator (prapasa and Cosmetics). If you want to more latest jobs circular news in Bangladesh, keep connect with us. Thanks. This entry was posted in All Jobs, Government Jobs by admin. Bookmark the permalink.